As we approach the halfway point of season three of The Killing, the investigation into the deaths of 17 dead girls and the missing Kallie seems to be going nowhere. Every lead is a dead end and Linden (Mireille Enos) and Holder (Joel Kinnaman) can’t seem to get anywhere with the case. That’s not to say this episode wasn’t without a few surprises, but the frustrations of the tediousness of investigating a case came through in this episode, “Scared and Running.” Though I have been enjoying this season so far, there are a few things I feel could be explored on a deeper level. The first two seasons dealt with Linden’s struggles being a single mother to her son Jack (Liam James). This season has Jack living in Chicago with his father. He only visits his mother occasionally (he appeared in the first episode) and seems to communicate with Holder more often than his mom. While that dynamic is interesting, I miss the direct impact raising Jack had on Linden’s dedication to her job. She might be dealing with some guilt, but she can now be on the job 24/7 without worrying about CPS taking her son away. What I’m missing is that connection to real life we saw in the first two seasons. That said, I’m enjoying the mystery of this season. I’m still unclear on how everything is going to fit together. This show is good at misdirection. Throughout this entire episode it seems like they are finally going to find Kallie – possibly even find her alive. Alas, it’s some other girl and Kallie is nowhere to be found. What we do know is that Kallie’s mom’s boyfriend has Kallie’s cell phone. At long last, Kallie’s mom (Amy Seimetz) knows something’s wrong, but it’s too little too late for her to help her daughter. 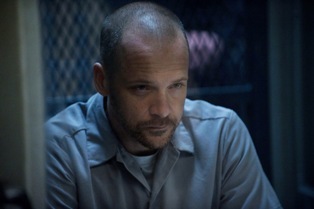 As always, one of the most interesting aspects of the show was convicted killer Ray Seward (Peter Sarsgaard). He only has two weeks until his execution, and he appears to be hatching some kind of plan, but what it is I’m not sure. His son’s foster mother paid him a visit to request he sign away his parental rights to his son. She also told him his son hoped to visit him, and that the son had forgiven him for the murder of his mother. Seward simply laughed at this. What that laugh meant – I don’t know. It’s was pretty unsettling regardless. There was a lot of setup this episode, which leads me to believe things are going to heat up over the next couple of episodes. What I’m looking forward to most is seeing where they’re going with the Seward storyline. It almost feels like two separate stories at this point, despite Linden’s belief that it all ties together. Given the way things can turn around in an instant on this show, I’m doubting that whatever seems most obvious at this point is where things will actually end up.